Westmalle’s Tripel is a style-defining beer brewed at a Cistercian abbey in Malle, Belgium. Westmalle is a Trappist brewery, a designation enjoyed by only 6 other breweries in the world, all but one in Belgium (the other is Dutch). Trappist requirements define where the beer must be made, who must make it, the role it must play in the functioning of the abbey, and how profits are to be spent. It is a designation rather than a style, and non-Trappist beers structurally similar are often labeled “abbey”. “Tripel” itself is also not a style, rather a broad category. Most Trappist operations tend to produce three beers: a base beer, a stronger, darker beer, and an even stronger beer, which tends to be pale to golden. The strengths of the beers are defined with colored caps, numbers, and names. Popular wisdom holds that the “dubbel” and “tripel” designations came about due to brewers doubling and tripling their grain bill, resulting in doubly and triply strong beers, respectively. Brewed from the same recipe since 1956, Westmalle’s tripel is considered the archetype of the style and is widely imitated. It’s a golden-orange beer with considerable carbonation, intense complexity, ponderous depth, and nuanced aromatics. Called weissbiers (white), weizenbiers (wheat), and hefeweizen (yeast-wheat), German wheat beers are a classic style originating in Bavaria. Required by law to be made of at least 50% malted wheat to malted barley, Bavarian wheat beers often contain between 60-70%. All use a specialized yeast which often imparts intense, phenolic aromatics redolent of clove and vanilla and banana-like esters. The style is minimally hopped and highly carbonated, making for refreshing summer drinking. Most beers are unfiltered and cloudy, though filtered versions (Kristal) do exist. Saison, meaning “season”, is a Wallonian (southern Belgium) farmhouse ale historically brewed for a manor’s laborers. Before the advent of refrigeration, brewing during the summer was ill-advised and often disastrous due to bacteria and wild yeast. As a result, a brewer’s last batch of the cool season had to be both strong and sturdy enough to last through the summer, but also refreshing and quaffable. As a result, most saisons use pilsner malt and noble hops, in the lager tradition. However, saisons are ales, and Belgian ales at that. They employ Belgian yeasts, are often dry-hopped, and frequently utilize herbs, spices, and candi sugar. 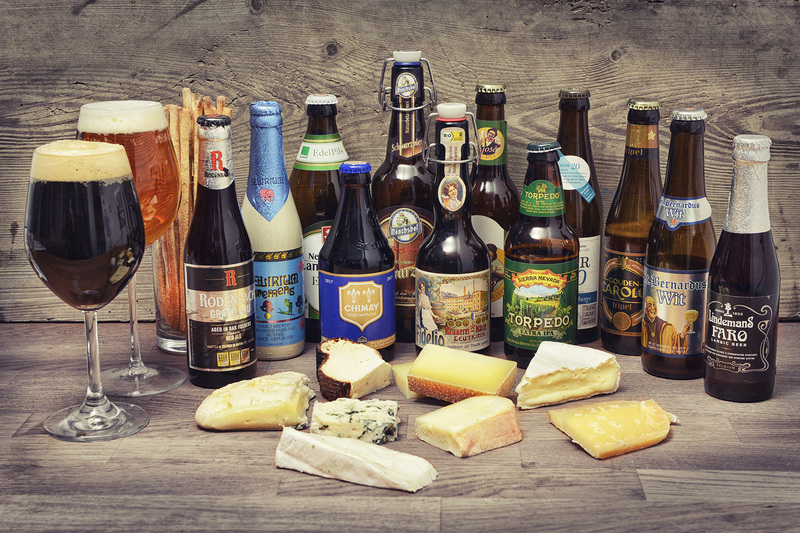 True artisanal ales, saisons are unique and varied, and are best thought of as a category rather than a style. Originating in Flanders, northern Belgium, this rare but resurgent style is distinct and truly memorable. Nicknamed the “Burgundy of Belgium”, this is a sour beer fermented with traditional ale yeast, wild ale yeast, and bacteria. Aged in oak barrels for up to two years and blended with younger beers, Flanders Red is simultaneously forthright and balanced. Like red wine, it has noticeable tannins and astringency, and is often fruity and spicy. Sour beers, once in serious decline, have become tremendously popular among craft beer aficionados, with Sonoma County’s Russian River Brewing playing a pivotal role. Barley wine is arguably the cognac of the beer world, a rich, complex beer made for sipping and celebrating. Originating in England, barley wines, traditionally known as “old ales” or “winter warmers”, were often a brewer’s biggest offering of the year. They are strong (7-12% ABV), malty beers that are minimally hopped and designed to age. Usually made with pale and caramel malts, barley wines are chewy, rich, and viscous. Notes of toffee and caramel are typical, as is a wonderfully intricate depth. American versions tend to be higher in alcohol, much hoppier, and less balanced. First brewed by the monks of St. Paula (which led to Paulaner’s name), this Bavarian specialty lager was designed to be strong, hearty, and nourishing for Lenten fasts. It is a malt-forward style, very lightly hopped, and tends to be deep gold to dark brown in color. Named “Salvator” (savior) for rather obvious reasons, the beer’s name was trademarked in 1896, forcing competitors to rename their offerings. Many chose names ending with the suffix “-ator”, and today there are some 200 “-ator” named doppelbock beers in Germany. “Stout”, as an adjective, means strong, and this is indeed how the beer style known as stout got its name. Capitalizing on the success of porter, stout’s forerunner, stout was effectively a stronger, bigger version of a brewery’s porter. Originally called “stout porter”, it eventually developed into its own style, and was traditionally fuller-bodied and higher in alcohol than most porters, though today’s stouts are usually session beers. Over the years different stouts developed, including milk stout, oatmeal stout, coffee stout, and imperial stout. The world’s best selling stout, Guinness, despite its imposing appearance, is actually a very light-bodied, low alcohol brew, its ABV (4.2) less than American Budweiser.